De Oude Kasteel - Riebeek Kasteel Accommodation. De Oude Kasteel is comprised of the beautifully restored Victorian house with matching honeymoon cottage and the newly built Sunrise Cottage, all standing next to each other on the same grounds. Nestled in the historic village of Riebeek Kasteel set at the foot of the Kasteelberg mountain amongst olive groves, vineyards, farmlands in a myriad of ever changing colours. Because of it's Mediterranean climate with mild and pleasant winters the Valley is ideal to visit at any time of the year. Visitors can enjoy game drives on nearby farms and nature reserves, an abundance of birdlife, hiking, mountain biking and various other activities. If you are simply looking for good food and wine you have come to the right place. Excellent wineries and great choice of restaurants to suit all palates. So why not come and enjoy old world charm blended with the comfort of modern living. Ideally suited for a group of friends or family or the honeymoon couple with wedding guests. Peaceful setting, relaxed atmosphere - home from home! Main House (Unit 1) sleeps 4/5, offers 2 luxurious, en-suite double rooms, one with shower and the other Victorian bath, guest cloakroom, 2 lounge areas, 1with with a daybed for the 5th guest, and the other with an open fireplace, fully equipped farm-style kitchen, patio, braai facilities and tiny plunge pool to sit and cool off in. 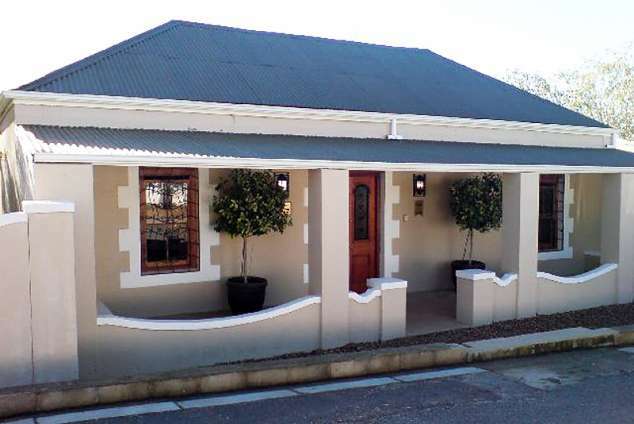 Separate Honeymoon Cottage (Unit 2) sleeps 2, with own entrance, open plan double bedroom, full bathroom, lounge area with fireplace, kitchenette (microwave, electric wok, health grill) and patio. Sunrise Cottage (Unit 3) sleeps 6, a newly built architect designed double volume dwelling with open plan lounge and fireplace, kitchen with electric hob and oven, dining room, two double en-suite bedrooms with full bathrooms and a 3rd double bedroom on the mezzanine level with it's own dedicated shower room at the foot of the stairs. Stoeps off of downstairs bedrooms and lounge. Lovely gardens. Mountain views. Off street parking. Centrally located with restaurants and shops within close walking distance. Just one hour's drive from Cape Town along the N7 to Malmesbury and then the R45 towards Paarl, you will find the turn off R46 for Riebeek Kasteel. Having passed rolling wheatfields and farms the scenery will dramatically change as you come over Bothmanskloof Pass to find the glorious Riebeek Valley spread out before you. Take the 2nd entrance into Riebeek Kasteel which is the Hermon Road. Continue until you reach the 4 way stop with Travellers Rest on your left hand side. Turn left into Van Riebeek Street. You will find De Oude Kasteel on the 2nd corner - right hand side. 67371 page views since 06 Jul, 2007.